Yes, I know it's Wednesday. Let's just say it's been a busy week. Much more music coming soon... But first, let's talk about my weekend. What would happen if a group of punk kids broke into a marching band's storage unit, made off with the instruments and some of the uniforms, learned some songs, built some stilts, and hit the streets? Something very like the Hungry March Band, who recently graced the streets of Seattle as part of Honk Fest West. A few hours on the streets being blissfully assaulted by brass and drums left me smiling from ear to ear. The festival is a celebration of public music, generally unamplified, hugely energetic, and teetering on the brink of anarchy. It boasts crazy circus-punk outfits, irrepressible spirit, and music ranging from the precision drumming of the Garfield High School Bulldog Drumline to the throbbing, utensil-decorated Titanium Sporkestra. 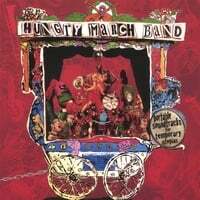 So when I returned home, I dug up this album by the Brooklyn-based Hungry March Band. Reeling from Balkan to funk to other songs uncategorizable but irrepressible, their brass and drum sound sums up the spirit of HonkFest. They're not complete without visuals, however, so go see them -- or at least run this slideshow while you're listening.